The Department of Education has partnered with Save the Children Philippines and Prudence Foundation to reduce the risks of natural and human-induced hazards to children and to establish an effective program that will improve the safety and preparedness of schools during calamities. 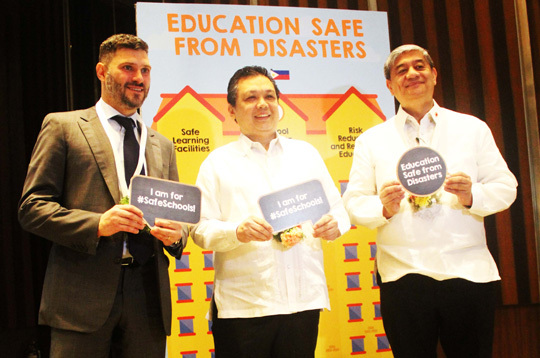 From left: Prudence Foundation executive director Marc Fancy, Department of Education undersecretary for administration Alain Del Pascua, and Save the Children Philippines chief executive officer Alberto Muyot jointly launched the Education for Safe from Disasters Project. Save the Children Philippines chief executive officer Alberto Muyot said students’ safety are critical especially since they spend an average of five to eight hours a day in schools during weekdays. He stated that from 2007 to 2012, major disasters affected around 11 million schoolchildren in the Philippines, jeopardizing their right to survival and basic education. “We want to ensure that schools not only give children access to education but also guarantee their safety and survival in times of emergencies,” said Muyot. “Safety is everyone’s job,” stated DepEd undersecretary for administration Alain Del Pascua. “In the Department of Education, we have worked hard on mainstreaming the Comprehensive School Safety Framework into the education system which aims to strengthen the pillars of safe learning facilities, school disaster management, and risk reduction and resilience education for schools,” Del Pascua underscored at the program launch of the Education Safe from Disasters Project. With the theme, “Developing an Ecosystem for Comprehensive School Safety in the Philippines,” the program shall build an enabling environment that will empower all stakeholders to realize the goals of the CSSF—a global framework aimed at reducing risks from hazards throughout the education sector by addressing the stated three pillars of school safety. The program shall establish an integrated disaster management system within DepEd to continuously improve knowledge and capacity of all its personnel and learners on CSS across all levels: national, regional, division, and school. Online resources and tools and training will be provided to schools and DepEd executives, while research will also be conducted on potentially adapting the model in other Southeast Asian countries to benefit a greater number of learners and teachers. DepEd’s Disaster Risk Reduction and Management Service and the Information and Communications Technology Service will lead in facilitating the project, which will be piloted in 16 schools divisions of the National Capital Region. In its third year, the program will be rolled out in a second region and will start the preparation for its nationwide scale-up. Prudence Foundation, the community investment arm of British life insurer Pru Life UK, recognizes that education is key to mitigating risk and contributing to early recovery. “Over the last five years, we are proud to have been supporting the Safe Schools program here in the Philippines, supported by DepEd. We are pleased to continue this partnership, and hope this project will further empower Filipino children, teachers, and the community to reduce their vulnerability from natural disasters,” said Marc Fancy, executive director of Prudence Foundation. The program is estimated to benefit some 20.9 million learners in close to 47,000 schools across the 17 regions in the Philippines.